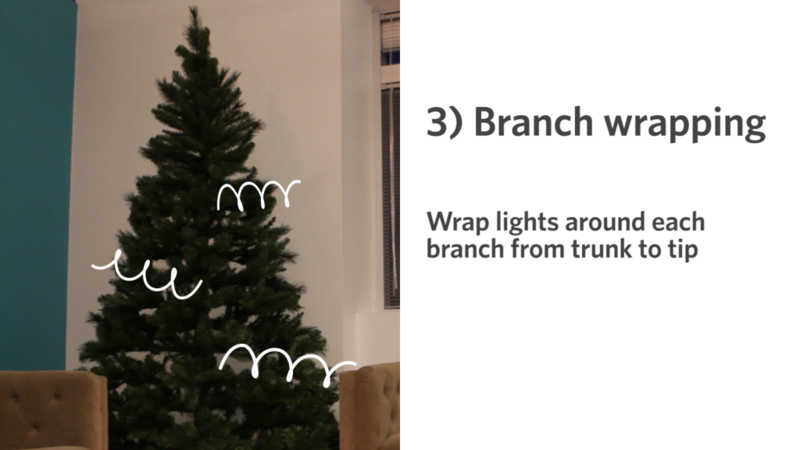 Watch our video for the best way to hang lights on the tree. When it comes to lighting a Christmas tree, there are many different ways to hang the lights on the branches. Expert designers use lots of lights to ensure that the tree looks bigger and fuller; they also spend a lot of time placing lights around every branch of the tree. For your own tree, you may just want to simply put up the lights and get into the holiday spirit. In case you’re looking for the best ways to light up the tree, we decided to take one tree and hang the lights three different ways. Our tree is 7.5 feet tall and we used 6 strands of lights (100 lights per strand). 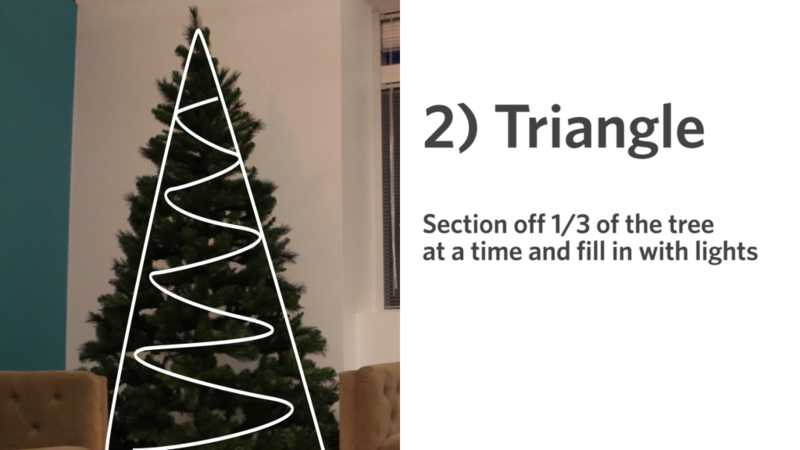 We timed each method to give you an estimate of about how long it might take you to light your own holiday tree. After setting up the tree, get out your lights and inspect them. You’ll want to be on the lookout for frayed wires, broken bulbs or any other visible faults. Untangle your lights and plug them in to ensure they all work. It’s best if you keep them plugged in while hanging them on the tree – not only will you be able to see “blank” spots, you’ll be assured that the string will reach the outlet. Set down your extra tarp on top of your tree skirt. When hanging lights, needles often fall so the tarp is a good way to catch them and prevent a giant needle mess. Always hang your lights before hanging your other decorations. How many lights does the tree need? The rule of thumb for lighting your tree is to plan on using 100 lights for every 1.5 feet of tree (so a 6-foot tall tree should use about 4 strands of 100 lights). 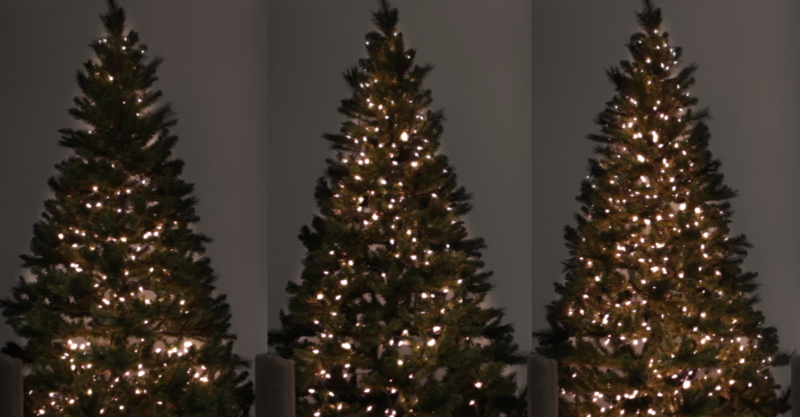 If you want a brighter tree, use more lights by repeating your pattern. Some homeowners prefer the appearance of large bulbs, others like lots of small bulbs. Whatever type of bulb you choose, use the same type for the entire tree for the most consistent appearance. 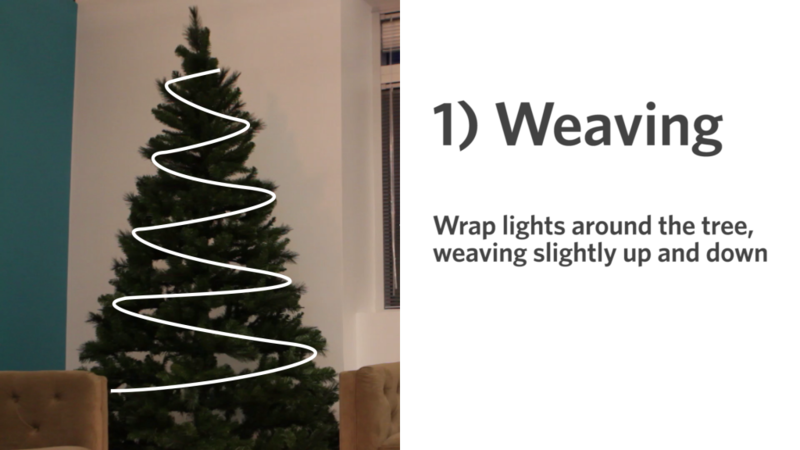 With weaving, you’ll want to start hanging lights at either the top or bottom of the tree and weave the string around the tree. Some prefer to vary the height when weaving, giving a slight up-and-down bob to the weave. This is the quickest way to light the tree. To increase the amount of lights, simply weave your strings of lights twice. Time: about 15 – 20 minutes. Section off the tree into three vertical sections, like you would a pie. When hanging your lights, focus on stringing the lights in an up-and-down method within that third portion of the tree. This method of lighting is a bit more time consuming but allows you to focus on small sections. Time: about 20 – 30 minutes. The most time consuming method of tree lighting is lighting each individual branch. Start at the bottom of the tree and hang the lights in and out along each branch, slowly working your way around the tree. Because the tree will be lit from trunk to tip, this is the best way to bring volume to the tree and give it that “expert” look. Time: over 1 hour. When you are done, turn off the lights in the room and look for empty or dark spots. Gently move lights around to give it a more even look. Carefully remove the tarp and empty the needles outside. Now you’re ready to decorate the tree! With a background in furniture and antiques, Anne has spent the last several years writing about home improvement and interior design. An avid traveler, she loves to collect pieces that tell a story and in her off hours she can be found hunting for vintage furniture and textiles. How Well Do You Know The U.S. Flag?